Oh yes, please. I’ll take a RoboSapien v2 (around $229 USD)! RoboSapien is a toy-like biomorphic robot designed by Mark Tilden and produced by Wow Wee toys. 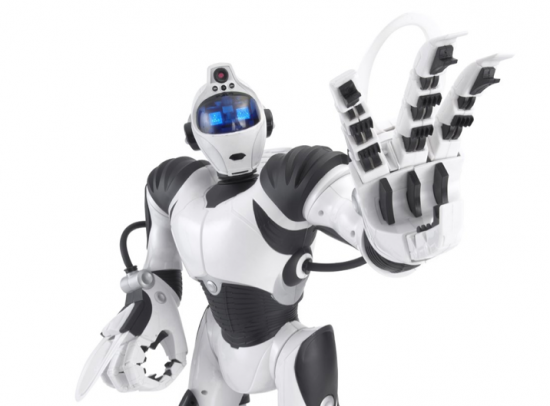 The RoboSapien is preprogrammed with moves, and also can be controlled infrared by the included remote control, by a personal computer with the help of an infrared transmitter, or from an infrared equipped PDA. He is capable of walking without the assistance of wheels on his feet, grasp objects with either hand and throw them, and has several different vocalizations. The remote control has 21 different buttons. With the help of the shift button, you have access to 67 different commands that the robot can execute.